The food sold by streetside vendors usually is connected with junk food, fast food. Most of them are, but this one isn't. When I was a kid my mom ran a tiny store selling some popular street food like soy pudding and chicken soup. Next to us there was a couple selling fish ball and lettuce soup. Everyday after school I got to work at the store. One of the favorite parts of my job (it's soooo important to create fun from work :) :) was, going to the next store and looking into their soup's pot during the closing hours. All the soup was gone and left with a mountain of fish heads, fins and tails etc... why kid so amazed with such battlefield-like scene?... Those bones were never thrown out, the couple everytime just added in more new bits before making another batch of soup base. So every essence from old bones and a fresh taste from new bits all went into one soup pot! Then the couple proceeded to washing and chopping the lettuce, mincing fish meat and checking every bottle of sesame oil. They prepared their soup exactly what every mama did at home except in a larger scale, so which never was junky nor fast. The street vendors don't really shape the fish paste into ball ... think of selling a hundred bowls a days it is just impossible to hand-make a thousand of fish balls. The vendors scrape a bit of fish paste into boiling soup with a wet spoon, so their fish balls are always irregular in shape. 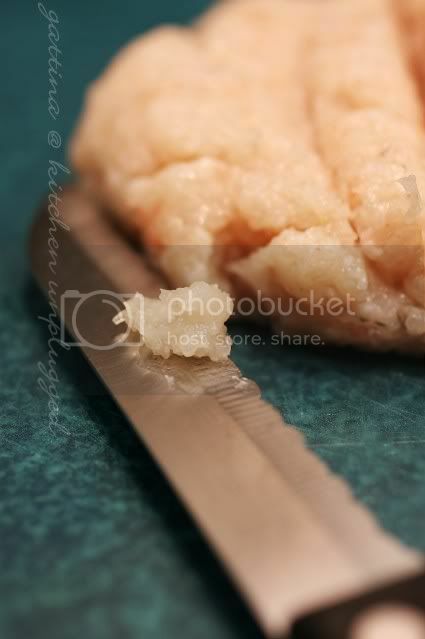 But just to cook to a few people, it really doesn't trouble me when I shaped the fish balls by hand. The authentic version adds with a lot of white pepper and sesame oil, but now I'd like to try another version that skips the two, but put into arugula to maintain a peppery taste in soup. Pre-heat some oil in a pot, saute the garlic and leek/spring onion over very low heat for a minute, then add carrot and water. After the water boils, drop the fish's and shrimp's bits, continue to boil the soup over medium-low heat (with little bubbling is good) for 1 - 2 hours. Salt and pepper to taste. Best to leave the soup base overnight. In a serving bowl, place some chopped lettuce in the bottom. Bring the soup base to boil, drop the fish balls in and cook until they just cooked, probably only take you a minute (overcook will make the fish tough). 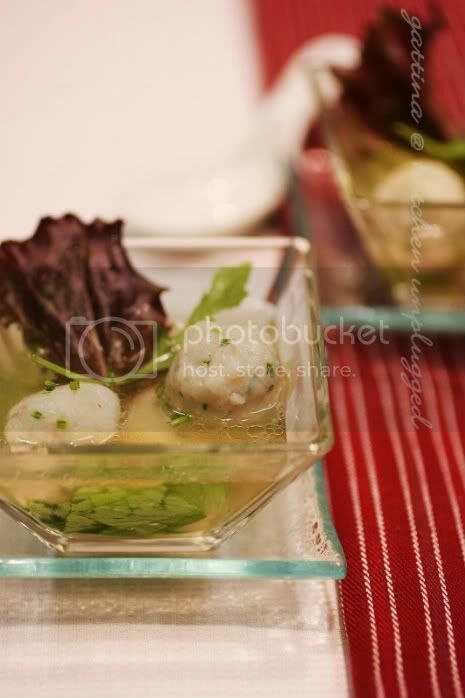 Spoon the soup and fish balls into the serving bowl. Drop a handful of arugula on top. Serve immediately. 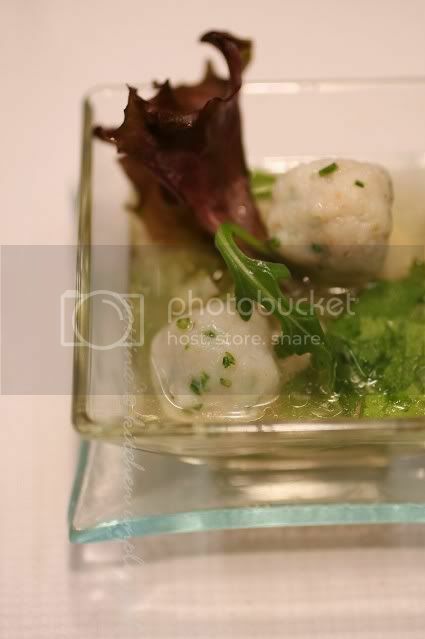 Very nice Gattina.....I had this type of fish ball soup on my last trip to Hong Kong long long ago but I never forget the taste! A lovely dish! Light and tasty! This sounds so delicately aromatic...and a nice change from the kind of fish balls that "squeak" when you bite them! I know how passionate the Cantonese are with fish ball (and meat balls!). Love this recipe, Gattina. 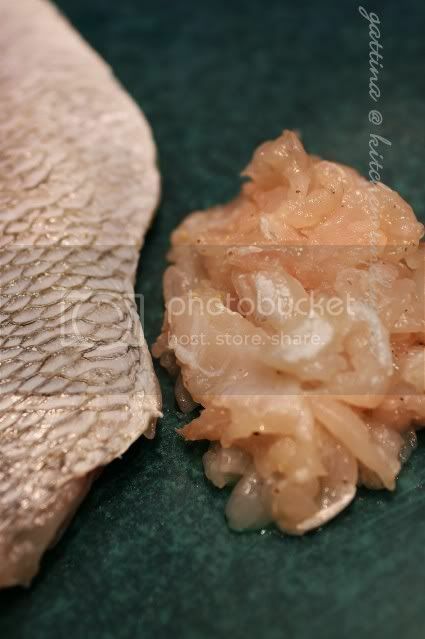 In Vietnam, sometimes the cooks put in a bit of starch in when pounding the fish (or cuttle fish). Tasty! 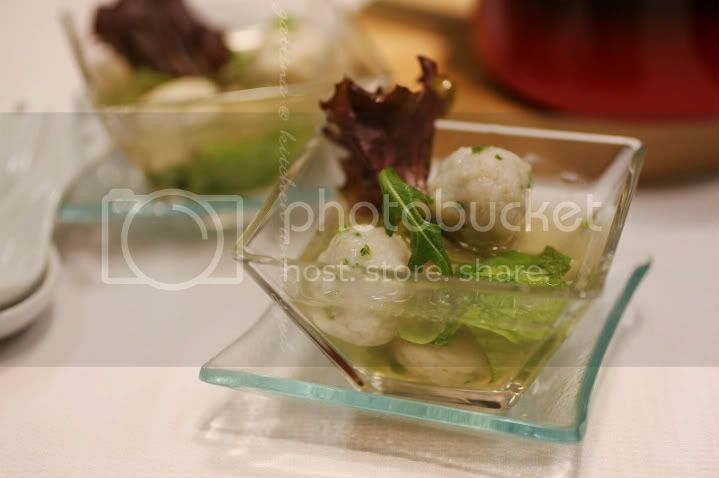 I love fish balls and the broth looks so clear! Well done :)! It's a good, cool day in NYC for Vegetable-n-Fish soup. Yum! I dream of eating Hong Kong seafood. What a beautiful soup. Sounds fantastic! I love nice fish balls. But have yet to venture into it. Yours look stunning I must say. Your soup looks awesome! I'm craving for one now. Beautiful presentation and stunning shots as always! Lovely, soulful recipe ... just what I need on a cold winter night! Great recipe and love your blog. 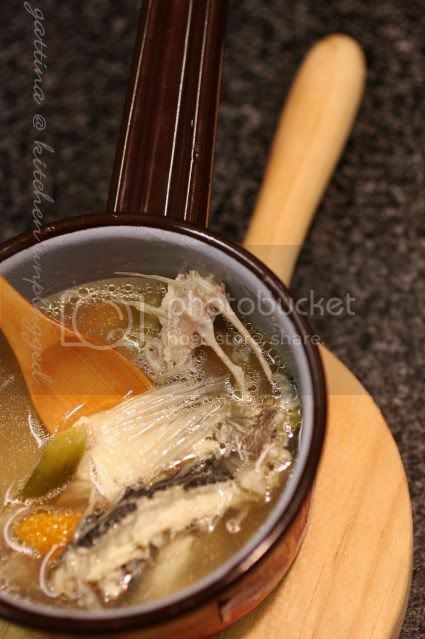 What a georgous & tasty looking fish soup this is, Gattina! Gattina, I love the street food of Hong Kong! It was a bit of time for me to get used to eating in these stalls (open air or not) but oh so yummy once I did take the plunge! Cheers!